Com.A.Sampath MP inaugurated the 5th biennial circle conference of Kerala at Com.S.Madanan nagar, (Sopanam Auditorium), Kollam on 11th November,2018 with an educative and inspiring speech. The two day conference started with flag hoisting by Com.V.A.N.Namboodiri, Advisor followed with offering floral tributes to the martyrs . Com.R.A.Nair , Circle President presided. The inaugural session was addressed by Chief Guest Shri.D.Manoj, Controller of Communication Accounts, Coms.C.Santhoshkumar, Circle Secretary, BSNLEU, T.Santhoshkumar, Circle Secretary, SNEA, Venkateswaran(CGPA), N.Chandrasekhara Pillai (AIPRPA), N.R.Somasekharan Nair(CCLU) and R.Padmanabhan Nair (BSNL Security Staff Union). 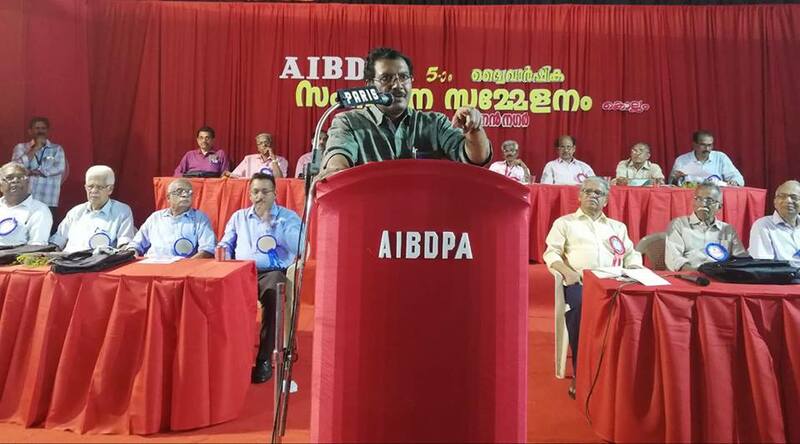 Com.V.Rajendra Babu, Mayor and Chairman, Reception Committee welcomed and N.Sasidharan Nair, General Convenor, Reception Committee proposed vote of thanks. The subject session held in the afternoon on 11-11-2018 was inaugurated by Com.K.G.jayaraj, General Secretary with a detailed speech covering all the issues of the pensioners. Com.N.Guruprasad, Circle Secretary presented the biennial report. Thereafter a very useful seminar was held with Com.P.V.Chandrasekharan , Patron as moderator. The seminar was inaugurated by Com.P.K.Gurudasan, veteran leader and former minister of Kerala. The subject , ” Social security of elders in the neo-liberal period” was presented by Shri.Alexander Jacob, Former DGP of Kerala in an effective and admirable manner. Coms.C.C.Pillai, former Secretary General,NFPE and P.K.Muraleedharan, Convenor,NFPE,Kerala. Com.K.Damodaran, Organising Secretary welcomed and Com.K.Mohanan Pillai, Joint Convenor, Reception Committee thanked. When the session resumed on 12th morning, Com.K.J.Sanalkumar, Treasurer presented the biennial audited accounts. 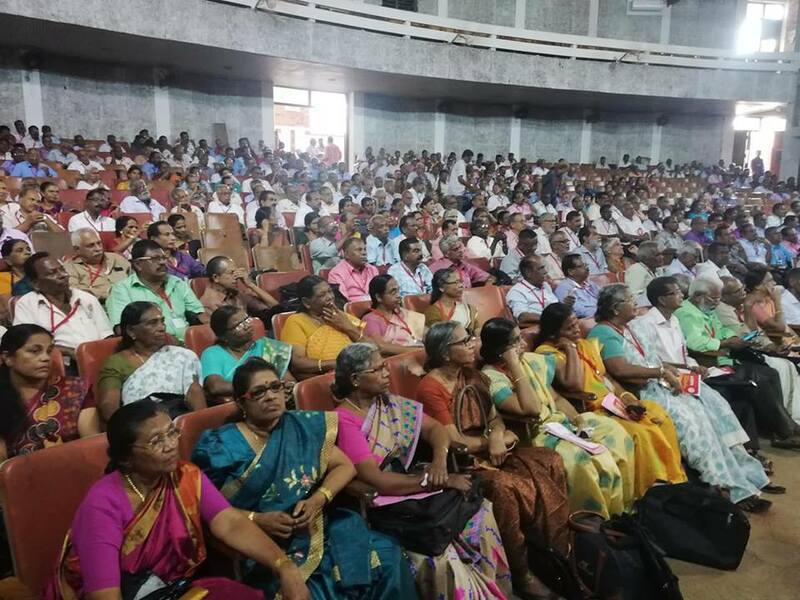 In the discussion that followed, 32 comrades participated which was replied by both the General Secretary and Circle Secretary.Then the report and accounts were adopted . 479 delegates from all districts participated. Office bearers were elected unanmously with Com.R.A.Nair (President) Com.N.Guruprasad,(Circle Secretary) and K.J. sanalkumar (Tresurer). A 13 member Circle Womens Committee with Com.Lusy Isac as Convenor was also elected. Resolutions were adopted on important issues. The Reception Committee with Com.V.Rajendra Babu (Chairman) and N.Sasidharan Nair made excellent arrangements for the successful conduct of the conference.